All Posts / Our Stories / Hey Coach! / Hey Coach: Sweeping Secrets!! 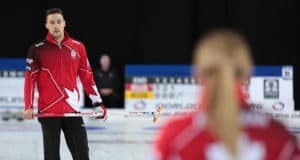 All those involved were required to sign a confidentiality agreement so the information would not come out prior to the Games in Vancouver. We have kept a few things under wraps that still need some further research however I asked Scott to share a few of the key findings with you. 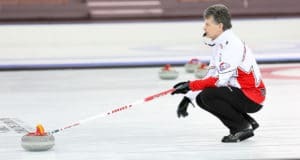 For the past number of years, researchers (lead by Dr. Thomas Jenkyn) at the University of Western of Ontario have been studying sweeping and trying to determine exactly what it does to the path of a curling stone. Over the coming months, scientific papers will be published with these specific findings. 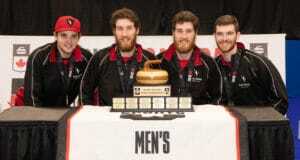 These blog entries will explain some of the findings over the next few months and will do so in terms we as curlers will understand. Two types of camera systems were employed for the study. One was a high speed motion capture system. It is the same type of system used to digitize movement in the video game industry. These cameras allowed the scientists to know the exact speed and rotational force on the rock at any given time. The other was an infrared camera used to determine ice temperature and the heating effects created by sweeping. 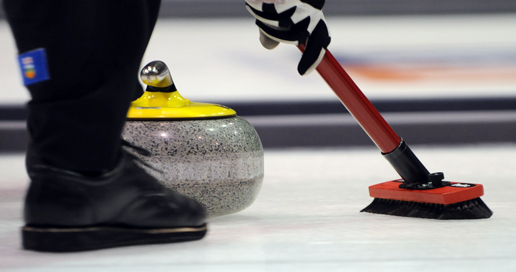 The first findings dispelled the myth that sweeping actually melts the ice surface. In fact, the best sweepers in the world can only increase the surface temperature by approximately 2 degrees Celsius. Most clubs keep their ice around -5 degrees Celsius so we are still a long ways from the melting point. You may ask why the head of your brush gets damp. The scientists concluded that microscopic frost forms on top of and in-between the pebble. The brushing motion is able to smooth and warm up the frost particles and in the process, create moisture that is then transferred to the brush head. How far can top sweepers “carry” a rock? The study looked at the effects of sweeping from approximately 2/3 of the way down the sheet of ice to the conclusion of the stones motion. A mathematical formula was created to predict where the stone would stop based on its velocity and rotation as it crossed the hogline. It was found that top sweepers could extend the path of the stone by 6 to 7 feet over the final 1/3 of the sheet. That should make the draw to the button seem a little easier now! As well, the research team concluded that keeping a rock “clean” (with firm pressure on the brush head) could extend the distance the rock traveled by 2 to 3 feet. Another discovery involved the angle of the brush head. Picture in your mind a brush with the head attached to the handle at a fixed angle and the brush stroke being at 90 degrees to the path of the stone. We will call that “old school” (the researcher’s term, not mine). Now picture the current type of pivoting brush heads that are designed to rotate and thus allow the sweeper to get the brush head close to the stone from a variety of angles. Call that “new school”. With the help of the infrared camera, it was determined that an “old school” type angle of brushing [45-90 degrees] created a more even heating pattern which will ultimately have a greater effect on the path of the stone. It would be like handing you a paint brush and telling you to paint a wall. If you used the narrow edge of the brush, it would take you a lot longer to paint the wall then if you used the wider edge. It is the same theory. How close you sweep in front of the rock was then examined. As common theories suggest, it is important to have both sweepers as close to the stone as possible (both inside a 3 foot area in-front of the leading edge of the stone). The infrared camera showed that the outside sweeper starts the warming process which allows the inside sweeper to generate even more heat and influence the path of the stone. If any of these sweepers was beyond three feet in-front of the stone, the effects of heating were minimized or lost. As well, there was no increase in ice temperature in front of the stone when a third sweeper was introduced. This is a point that should be noted by all players in charge of the house. Watch the line and learn the ice. Your sweepers have everything under control. Additional findings with regards to the proper sweeping techniques and broom materials will be the topics of upcoming blog entries.